A young man lives unhappily in a valley. One day he meets an old man who lives on a mountain peak. At first the young man doesn't realize that he is talking to one of the most peaceful and successful people in the world. But in the course of further encounters and conversations, the young man comes to understand that he can apply the old man's remarkable principles and practical tools to his own life to change it for the better. Spencer Johnson knows how to tell a deceptively simple story that teaches deep lessons. The One Minute Manager (co-written with Ken Blanchard) sold 15 million copies and stayed on the New York Times bestseller list for more than twenty years. Since it was published a decade ago, Who Moved My Cheese? has sold more than 25 million copies. In fact there are more than 46 million copies of Spencer Johnson's books in print, in forty-seven languages--and with today's economic uncertainty, his new book could not be more relevant. 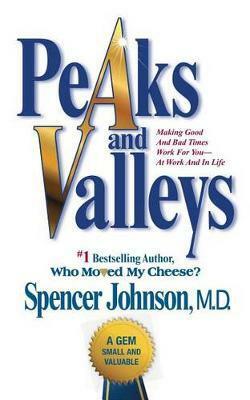 Pithy, wise, and empowering, Peaks and Valleys is clearly destined to becomeanother Spencer Johnson classic. Spencer Johnson has written or co-written three New York Times #1 bestsellers, including Who Moved My Cheese?, The One Minute Manager (with Kenneth Blanchard), and The Present. He received a B.A. in psychology from the University of Southern California, an M.D. degree from the Royal College of Surgeons, and is currently advisor to the Center for Public Leadership at Harvard University's Kennedy School of Government.